Whereas Scotland’s 2015 results could change the course of the 2015 General election result, the results from Wales will not. This is for a variety of reasons, with the main one being that there is far less of a Nationalist movement there. That said, it is important to understand what is predicted, and what might change given that every seat will count. on system called Additional Member System (AMS), which is much more proportional in terms of how votes are translated into seats as it combines First-past-the-post for constituencies and Party List (PR) to fill the remainder of seats. Like Scotland, Wales had an Assembly election in 2011 which gives us a slight clue as to how voting behaviour might change. The seats for the Assembly are coterminous (have the same boundary) as the seats for the a Westminster Parliament. But the key numbers to know are the seat count from 2010 and what the polls are saying now. In 2010, the share of the vote was Labour with 36%, Conservatives 26%, Liberal Democrats 20% and Plaid Cymru (Welsh Nationalists) 11%. 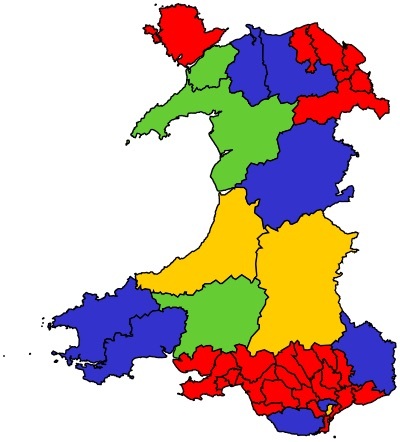 Wales’s 40 seats were shared like this: Labour 26, Conservatives 8, Liberal Democrats 3, Plaid Cymru 3. In the latest poll, from December 2014, there was a major change, but not in a way that matters given how First Past the Post works. Labour had 36%, Conservatives 23%, UKIP 18%, Plaid Cymru 11%, Lib Dems 5%, Greens 5%. The projected seats (assuming a uniform swing) were Labour 28, Conservatives 8, Plaid Cymru 3 and Lib Dems 1. This means that very little will change in terms of the seats for the major parties (although I will look at the possibilities in tomorrow’s blog), and thus, as long as nothing extreme happens between now and May, you can more or less predict the outcome in Wales. That said, it is worth noting how much of an example Wales is of the weaknesses of our election system. Firstly, Labour are at 36% again, but stand to gain 70% of the seats. UKIP, meanwhile, have 18%, but given the geographical spread of their popularity are unlikely to win a single seat. The second thing to know is that this is the most geographically over represented region in the UK. The average electorate for each constituency is 57,000, In Scotland and Northern Ireland it is 66,000 and England is 72,000. The Tories had planned to review constituency boundaries during this Parliament to try and equalise the number of people in each electorate and reduce the seats down from 650 to 600. As you can imagine, Wales would have been a prime candidate for culling and may have only had 30 seats at the end of it. Happily for Labour, the Constituency Review never happened in 2013 as the Liberal Democrats cancelled support for it when their Lords Reforms fell through. So, given that Labour in 2012 were polling at 54% and have lost a third of that in the last two years, they can consider themselves lucky that a silly political spat between Coalition Partners has kept them very likely to do very well in Wales in 2015. « 2015 New Year Politics Prediction….impossible!